We were working with Teraflex from 2008. to 2014. Current site is not maintained by us. TeraFlex has been professionally involved with Jeeps since the 1950s. Since that time, they have constantly added unique and innovative products to make the product line what it is today maintaining the dominant hold on the Jeep market. TeraFlex was started in the fall of 1996 to meet the needs of the growing market for heavy duty off road equipment and suspension enhancements. Our relationship with TeraFlex started in pre-Inchoo days of 2007. when Tomislav Bilic played a role in designing and building their first eCommerce solution that was based on CRE Loaded platform at that time. Before it gained a real traction, we made a decision next year to migrate it to Magento, that was emerging. Having limited experience at that time, we made a Magento + WordPress integration with the idea to benefit from advantages of both solutions. However, maintaining such solution was a huge challenge. The site turned to be quite successful since their online business steadily increased over the years and the community got a place to participate with their feedback and content. As TeraFlex grew, the need arises for the system to become more scalable and easier to maintain. In 2010, we decided to create a solution on a single platform – Magento. The challenge was to migrate previously added content in WordPress posts, image and video galleries to Magento. Some of the custom features that were previously developed on WordPress side were created as Magento extensions. Ex. Dealer Manager. The scope of work also included a full redesign with a goal to be more lighter, content-focused and faster. 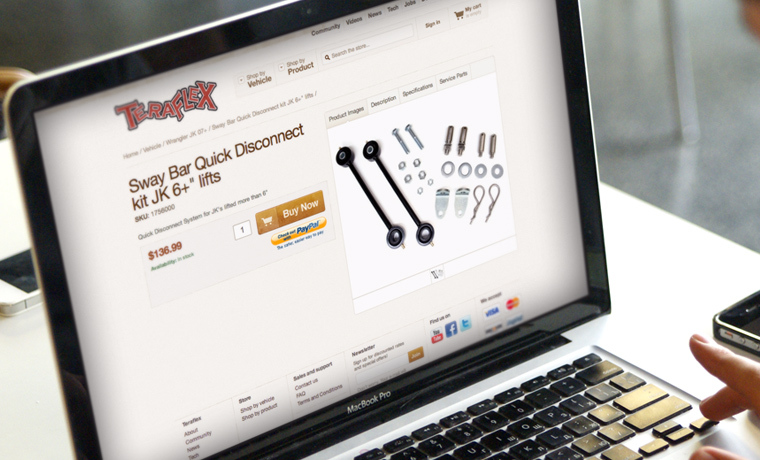 Secondary purpose of the Teraflex site was to connect with the Jeep loving community and provide an added value to the products they are promoting and selling. Integrating video materials of know-how and event videos was a must-have! It’s always a challenge to develop a web shop in the automotive industry, especially when it comes to connecting product data. Magento was a good choice with it’s layer navigation offering navigation by category and by vehicle fit. There were many custom features developed on the site due the specific requirements. The site now serves the visitors as an online store, education and information centre, dealer address book and a customer service portal.